You are not really a vegetable lover. You try, though, to find new ways to add them to your daily eating habits. At the same time, you are surely a huge fan of any kind of pizza. So, why not try this delicious recipe that combines both? Even kids will love them. 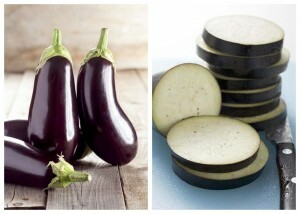 Pre-heat oven at 190o C.
Wash and dry your aubergine and cut it in thick slices (approximately 1 cm). Do not peel the skin off as slices will lose their shape while cooking. Drizzle olive oil on both sides of each slice, season with pepper and place them on a baking pan. Bake for 8-10 minutes, or until tender, turning them once. Take them out of the oven and top them with the tomato sauce (or slices tomato slices), sliced olives, basil and lastly the grated cheese and sliced olives. Put them back in the oven and bake them until the cheese is melted. Unfortunately, if you don’t like the texture and taste of their skin you cannot peel all of it off and prepare the pizzas; you will be making an aubergine mash “trying-to-look-like-pizzas” that way. Still, you can peel them off in stripes. They will still hold their shape and have less skin. For a charcoal taste, you can grill instead of baking the aubergine slices (step 3 of the recipe) using a grill-pan. Stack two slices of aubergine and their toppings on top of each other and you will have aubergine tower pizzas. I don’t use any salt because I find that the cheese and olives used provide enough salt for the recipe to be completely balanced. If you want, however, to put just a pinch, you can do it at the same time you season your slices with pepper (step 3 of the recipe). You can use whichever tomato sauce you prefer or even chopped tomatoes right from the tin. The good thing about this recipe is that variation is limitless.